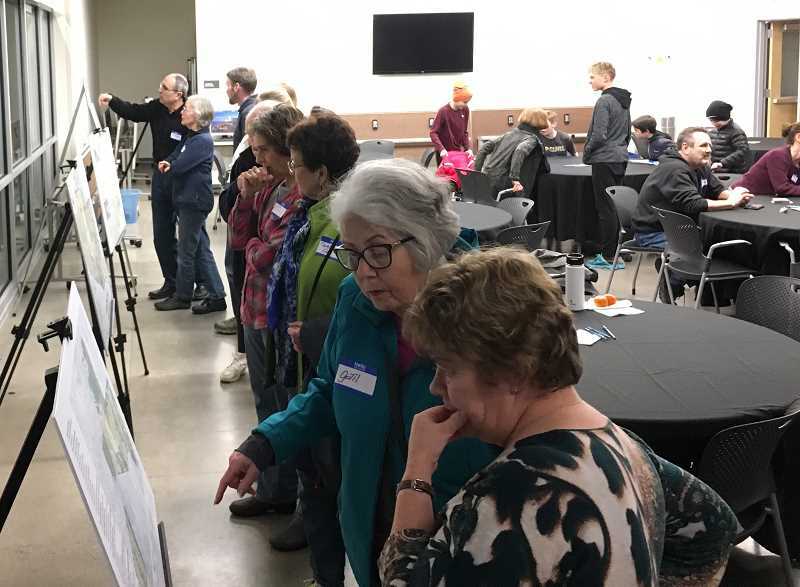 Local residents gave feedback, asked questions and voiced concerns last week over a proposal for a trail system and mountain bike skills course at Luscher Farm — the latest in a series of open houses that will continue next week with a gathering on Thursday night. That session is scheduled from 6-8 p.m. on Feb. 28 at the City's Operations and Maintenance Center (17601 Pilkington Road in Lake Oswego). Last week's discussion was led by Portland-based consultant and facilitator Nancy Hamilton, who used cutting-edge tools to take real-time, digital straw polls of the more than 60 people who attended the meeting. "I think it went very well. The intent was simply to hear where the community's pulse is and understand what things they're excited or concerned about, questions they may have that they were looking for answers to, or misinformation that we can correct and get everyone on the same baseline so that conversations moving forward are from an agreed-upon series of facts," Hamilton told The Review. Concept designs for the Parks & Recreation Department proposal, unveiled at a couple of community open houses in November, incorporate some of the mowed trails that already wind their way through the 152-acre area bordered by Stafford Road to the west and Rosemont Road to the south. Additional soft-surface trails would also be built. The Farr Bike Park, which would be located at the northern edge of the Luscher Farm property off Bergis Road, was designed by Christopher Bernhardt at C2 Recreation Consulting in Portland. It would include three downhill skills courses that vary in difficulty, with jumps in a range of sizes, banked turns, logs, wall rides and other features for mountain and BMX bikers to tackle. At the bottom of the three courses would be a trail that leads back to the top, where a large dirt berm would allow users to drop back into each course. Plans for the bike park also call for a bike parking pad (cars would use the nearby lot at Hazelia Field), signs, a welcome kiosk, a porta-potty pad and a shade structure. Total cost for all of the trails is estimated at $250,000. The plan has received pushback from the Friends of Luscher Farm group, which says the proposed trails and bike park don't meet the criteria for use of the property as outlined in the Luscher Area Master Plan created in 2013. Parks & Rec is also still waiting to hear back from Clackamas County on a land-use application that will either approve the plan or send it back to the drawing board. But last Tuesday's meeting wasn't really about those details; it was more about finding common ground between Parks Department officials and the community members who use Luscher Farm. "I've done this kind of work with other cities, jurisdictions and organizations, and the worst thing is to have no one show up," Hamilton said. "So it's exciting to see 60 people, from folks who've lived in Lake Oswego for a really long time to kids who are mountain bike enthusiasts, who want to make sure their voice is heard. It was exciting to help facilitate s group conversation." According to Hamilton, what she heard is that people are concerned that trail system development could negatively impact other things happening at Luscher Farm. Many care deeply about things like the community gardens, urban agriculture, dog parks and the general beauty of the space. On the other side of that coin, Hamilton said, she heard from folks who said they don't have a concentrated area now where mountain bike enthusiasts can gather. The Farr Bike Park proposal would be built on three and a half acres at the far northern end of the property, away from many of the other uses at Luscher Farm. "I think it was reassuring for some community members to understand that's a contained space and you can't even see it because of the slope up and back," Hamilton said. "If you're standing even at Hazelia Field, you can't see that space. I think that was reassuring to people, because I don't think a lot of people realized how big that Luscher Farm space is." Hamilton believes the biggest thing for the City to consider is that people are very excited about the opportunity to have a trail system that integrates thoughtfully with what's already at the farm so that people aren't running each other over. "There was a real strong sense that there should be a hybrid trail where there may be common entry points, but also a trail system where you're only able to walk or ride your bike so that people aren't in each other's way and feeling impinged by other activities. People wanted to make sure it's safe." At the Feb. 28 meeting, Hamilton said, questions for the audience will focus on the kind of trail system residents want and where people would access it for walking, riding a recreational bike or using a mountain bike. Residents who can't make it to the meetings can still offer their opinions through an online survey. Find it at http://bit.ly/luschersurvey.